The Ox generously shares his strength with timid Pisces. Therefore, people of this combination of signs will be able to rebuff offenders, they will not silently demolish humiliation. Pisces-Oxen easily settle conflicts, are benevolent towards all people. Although a bit shy, wary of new acquaintances, but find the strength to overcome their weaknesses. They are excellent diplomats, sympathetic friends and loyal partners. The kindness of Oxen-Pisces does not know the boundaries: they serve their close faith and truth. Absolutely honest and frank with the surrounding people, do not know how to lie, pretend. However, the detractors of the Pisces-Oxen should be aware of their rancor. They will take revenge on the offender all his life, regardless of any circumstances. For the modesty of the Ox-Pisces it is difficult to consider its essence. This is a real fighter and a great hard worker. Extremely honest, does not expect recognition and compliments. Do not advertise their achievements, does not stand out from the crowd. He is not inclined to material savings, he sees his calling in serving people. Helps all needy, does not think about own benefit. Pisces-Ox tries not to notice bad in people, endows them with non-existent virtues. Until the latter tries to find an excuse for unseemly acts. True, having convinced himself of the meanness of man, he will forever strike him out of his heart, he will remember for the rest of his life about the offense he has inflicted. This is the peculiarity of all Ox-Pisces: any patience has a limit. Shy Ox-Fishes forget about their shyness when it comes to really worthwhile business. They are not afraid of the hardest work, besides they are intellectually developed. With a great desire to take any case, if they see an opportunity to realize themselves. They are indifferent to material values, do not aspire to earn as much money as possible. It is quite successful combine pleasant with useful, therefore have a stable financial position, not exhausting yourself with hard work. Pisces-Oxen without regret spend all earned on close people, try to surround them with love and care. They love their home, they feel safe in their native walls. In every way they try to achieve harmony and pacification. Soft and tactful Pisces-Oxen are afraid to offend any careless word. They have strong intuition, they feel the mood of people around them. Therefore, they know exactly what to do in this or that situation. It is not in their rules to behave insolently and arrogantly, on the contrary, always restrained and even shy. Although inside each of the Pisces-Oxen the ocean of passions is raging, these are temperamental people. They can easily flare up, get angry, but most of all they take offense. And they do not just suffer from undeserved resentment, but engage in self-criticism. Are ready to reconcile to bad habits of associates, but mercilessly reproach themselves for the smallest weaknesses. Excessive anxiety and self-doubt greatly complicates their life. Each of the Pisces-Oxen dreams of romantic love, is looking for his ideal. Strives to find a reliable partner, like-minded person. First of all, he pays attention to personal qualities, and not to spectacular appearance. Is capable of a strong sense, remains faithful to his partner throughout his life. In the period of courtship, she behaves modestly and shyly, does not know how to make compliments, rarely arranges surprises. But his caring attitude is much more eloquent than any words. 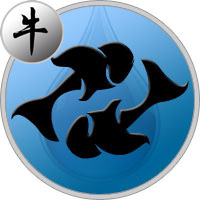 Pisces-Ox is a good family man, deeply devoted to close people. Not looking for adventure, does not like noisy companies. This is a big home-stay: it does not exchange a quiet, cozy atmosphere for any entertainment. Very attached to his half, adores children. He is a wonderful psychologist, he gets on well with people of all ages, but best of all with children. Pisces-Ox — a sensitive parent, the first to learn about the problems of their offspring. He devotes much time to their upbringing, tries to become a friend. Nature has generously endowed these people with a variety of talents. They can take place in the creative field, among their merits: developed imagination, rich imagination, strong intuition. Pisces-Oxen are able to embody their fantastic ideas, are not afraid to experiment and try everything new. Although very vulnerable and difficult to take criticism. Do not feel bad in the role of leader, can organize their own business. Excellent get along with partners, and with competitors. Oxen-Pisces are simply excellent in the role of psychologists or diplomats. They closely follow the reaction of others, even anticipate some of their actions. Favorably attuned to people, they try not to conflict. In their working collective are an example for imitation. Often hear praise, which in the depths of the soul are very happy. They rarely show their feelings, do not share doubts with colleagues, are always cheerful and cheerful. However, they are very worried about the result of their work. A friendly Pisces man, born in the year of the Ox, seeks to establish good relations with all the surrounding people. Unlike other representatives of the water sign, he is a more confident and determined person. In his actions and actions, one feels the influence of a strong, strong Ox, but still suffers from shyness. Hard-working, purposeful Pisces-Ox man who knows how to succeed, and acts gently and unobtrusively, not entering into conflicts with colleagues. Thinly feels the mood of people around him, does not turn his talent to evil, on the contrary, helps all those in need. In a loving relationship, he is a sensitive, affectionate partner, but will not tolerate the unworthy behavior of the second half, will never forgive betrayal. The soft Pisces woman, born in the year of the Ox, produces a deceptive impression, it seems fragile and tender, but sure enough. She likes to dream about something beautiful, almost impossible. But thanks to the influence of the Ox knows how to achieve the ideal result. A purposeful, hardworking person can easily take the place of a leader. And it is not motivated by the desire to assert itself, but a really necessary need to do what you love. In her personal life, she tries to avoid conflict situations, strife with violent quarrels and subsequent reconciliation is alien to her. Will be happy with a strong man, able to at least sometimes give in to her, indulge weaknesses. She lives in the interests of the family, strives to surround her relatives with care and attention.